Returning home on the ferry was one of the best parts of my nine-week trip to Alaska. I was able to totally relax, so much so that I took only a few pictures. Since for most of the voyage we were out at sea and away from land, I saw few birds or mammals that I wanted to photograph. Leaving the driving to the captain of the ship, I had plenty of time for socializing. I enjoyed many long and pleasant conversations with interesting people who also had no time pressures. The 1,629 mile trip from Whittier, Alaska, to Bellingham, Washington, took us out to sea for four and one-half days. When I reached Bellingham, I had only 1,413 miles to go before reaching home. Had I instead driven from Marveen and Wayne’s home in Nikiski to Boulder, I would have had to drive at least 3,400 miles. 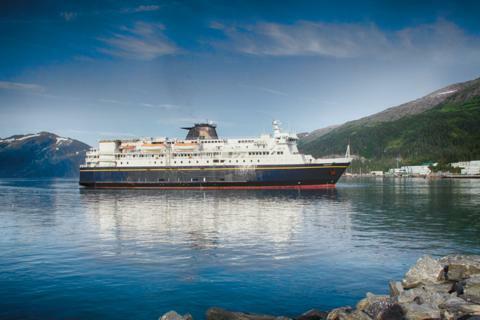 While most everyone calls this the Alaska Ferry, it’s really the Alaska Marine Highway System, which is a rare American example of a shipping line that offers regularly scheduled service more for transportation than for leisure or entertainment. I sailed on the M/V Kennicott, the newest ship of the line and the one that accommodates the most passengers. The ship has nine decks with a capacity of 748 passengers, including me, and about 100 vehicles, including mine. The Kennicott’s amenities include a hot-food cafeteria; a cocktail lounge and bar; a solarium; forward, aft, movie, and business lounges; a gift shop; 51 four-berth cabins; and 58 two-berth cabins. Some of the cabins had facilities, but mine was a “2 berth roomette without window, no facilities, or linens.” I was able to rent a blanket, sheets, and a pillow from the purser’s office, and since my cabin was approximately 4’x8’ I consider myself fortunate that I didn’t have to share it. Since I had made my reservations only five months in advance, I was lucky to get any room, and in fact, my roomette was all that I needed. But, otherwise, I would have had to sleep on deck with most of the passengers. Everybody seems to visit the Grand Canyon. In fact, close to 5 million people visit Grand Canyon National Park each year. But almost all of them go to the South Rim. Since I had visited the South Rim several times, on this trip through the American Southwest I took the road less traveled; I went to the North Rim for the first time. The road is 260 miles from where I had been staying near Sedona, Arizona, and that is about 150 miles farther than the distance between Sedona and the South Rim. In fact, the road between the South Rim and North Rim takes 215 miles, even though only 10 miles of canyon separate the two rims. If you were in a hurry, you might consider hiking the 21-mile trail between the two rims. But that would mean taking at least two days and nights and hiking down a mile and then back up another mile before you would get to the other side. I would chose to drive. Because the North Rim is so isolated, it has only a few of the visitors who make the pilgrimage to the Grand Canyon. I chose the word “pilgrimage” because many people consider it to be one of the seven natural wonders of the world. The North Rim seems to me to be much more natural than the South Rim because it’s not wall-to-wall tourists. In addition, the North Rim at almost 9,000 feet is about 1,000 feet higher and 10 degrees cooler than the South Rim. The North Rim is also more dramatic, at least for first time visitors to the Grand Canyon. The road to the North Rim takes you directly to Grand Canyon Lodge, where I stayed, rather than to one of the many overlooks at the South Rim. You don’t even see the canyon until you enter the lodge, which sits right at the rim at the edge of canyon. Somehow, I had the most fun of my whole trip to the Southwest when I went on a couple of very rough jeep roads near Sedona. I was man enough to sign up for the Broken Arrow/Scenic Rim Combo Tour with Pink Jeep. I wanted to take that tour the first morning that I was in Sedona. But since I was the only one who had signed up, they canceled it. Fortunately. When I got to the Pink Jeep office on time at 6:30 a.m., I learned that they had called to let me know that the tour was off. But they left the message on my home phone, which I hadn’t checked. The helpful receptionist recommended instead that I go to West Fork for my first outing in the area. I wrote about my trip to that beautiful canyon in my previous photo essay in this series. When the volunteer at the Chamber of Commerce told me that the view of Cathedral Rock from Oak Creek at Red Rock Crossing was the most photographed location in all of Arizona, I was skeptical. After all, the Grand Canyon draws huge crowds and its viewpoints are a lot easier to get to than the location of this shot. But many others agree with him. 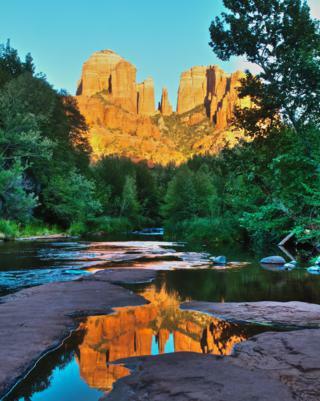 The volunteer said that Cathedral Rock was east of Red Rock Crossing, which itself is seven miles southwest of Sedona. That made it an afternoon shot with the sun at my back. He told me that I could get there easiest from Red Rock Loop to the north. Another way there was to take Valley Verde School Road to the south, but I would have to hike about a half mile if I went that way. Since I was staying at the Desert Quail Inn near Verde Valley School Road, I went that harder way. I was glad that I did, because I was able to get right out onto slabs of red rock on Oak Creek without getting my feet wet. 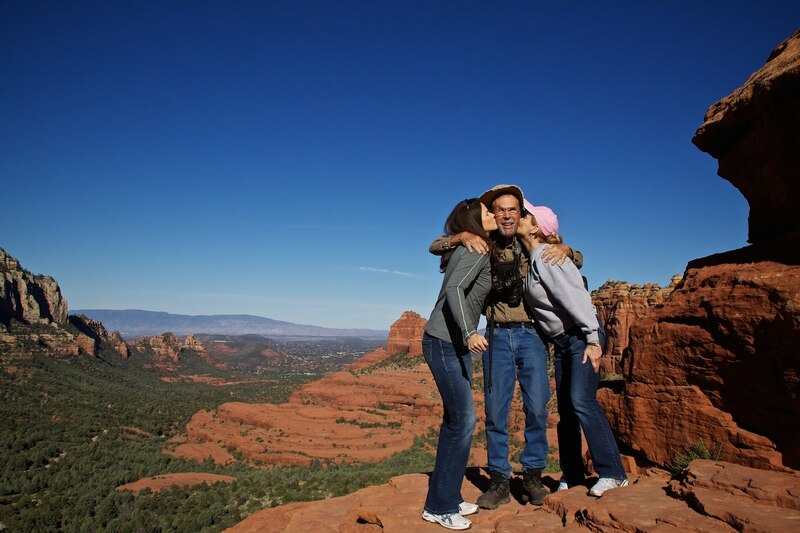 Sedona is one of the most attractive small cities that I have ever visited, both in the city itself and its surroundings. The only places that I know that compare with it in overall beauty are Carmel and Mendocino, California, and Aspen, Colorado. I love all of those small cities as I could never love a big one, not even San Francisco or Paris. When you see that the San Pedro River is a long, narrow oasis running northward through the Chihuahuan and Sonoran Deserts in southeastern Arizona, you will realize that the Casa de San Pedro Bed & Breakfast Inn is its heart. I had never before had the opportunity to stay in such a peaceful and relaxing lodging where I felt so completely at home. The owners, Karl Schmitt and Patrick Dome, are gracious host, great cooks, helpful, and knowledgeable. Widely read, they share their large library in the Casa’s Great Room. 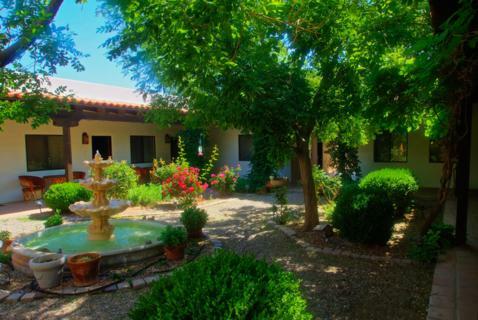 To the west of the river and the Casa are the Huachuca Mountains are its birdy canyons: Ramsey, Miller, Ash, Carr, and Garden. Ramsey Canyon Preserve the is place that brought me to the Huachuca Mountains of Southeastern Arizona. 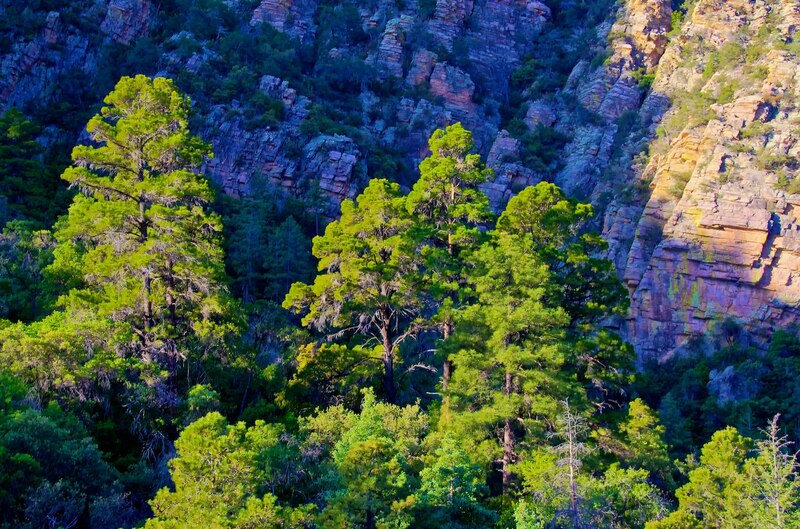 The Nature Conservancy protects this cool and moist canyon where the Sonoran and Chihuahuan deserts meet the Sierra Madre of Mexico and the Rocky Mountains. 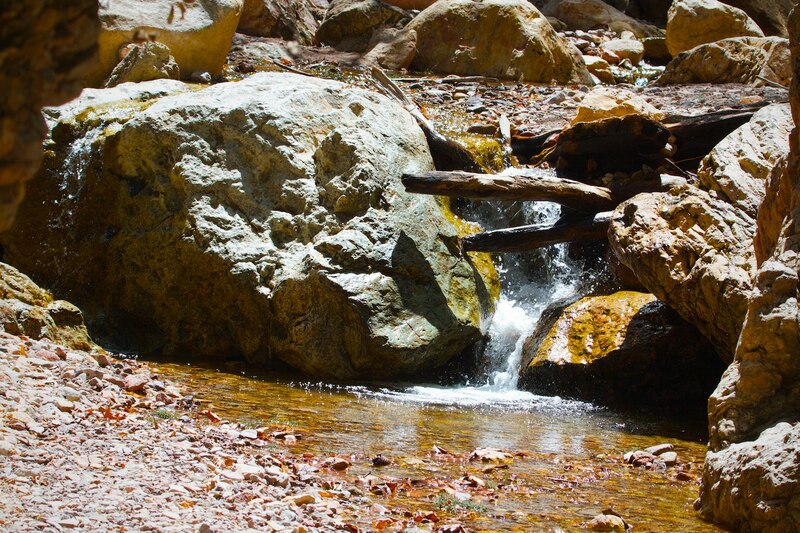 Among birders and other naturalists, Ramsey Canyon is famous for its great biodiversity. To me it is the most beautiful of all the canyons of the Huahuacas. 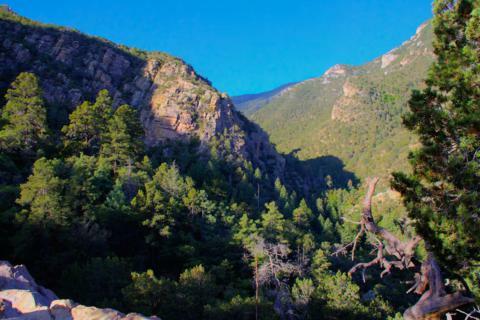 The Nature Conservancy’s 380-acre preserve guards the entrance to the Miller Peak Wilderness of the Coronado National Forest, which surrounds Ramsey Canyon. On two successive mornings I took a tour of the preserve and then hiked through it up this wild and beautiful canyon in the wilderness. After leaving the Chiricahua Mountains, I hiked up Miller Canyon in Southeastern Arizona’s Huachuca Mountains where I stayed for three nights in a cabin at Beatty’s Guest Ranch. A half mile up in the canyon along a steep trail I found an endangered Spotted Owl. I was carrying my heavy Canon 7D camera and 100-400mm lens, and I wanted to photograph this owl, which is in some ways my favorite species of birds. I love it when they look straight at my camera and me! 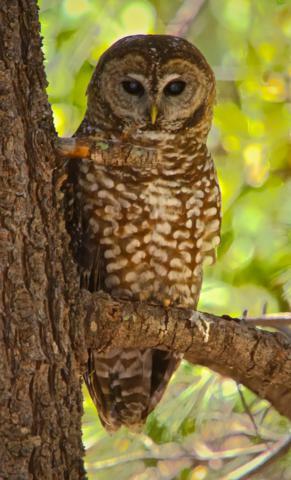 And I had never even seen a Spotted Owl before, much less photographed one. But it was turned away from me and probably had its eyes closed. As usual, I was optimistic. So I left. The reason why I left was to return to my SUV for even more photographic equipment. I grabbed my 1.4x teleconverter so I could zoom in closer at 560mm. I also brought my big heavy tripod both for stability and to hold the camera, something that would have become onerous for the long time that I guessed I would have to wait. While I was at it, I took my external flash and Better Beamer because the owl was sitting in the shade. I pulled out all the stops and had to wait three hours for it to turn and look at me. But I think that this photo shows that it was worth the wait. I only stayed four nights in Cave Creek Canyon, but it was why I went back to Arizona for the three-week trip that I just completed. I had enjoyed Cave Creek Ranch so much when I stayed there 13 months earlier that I told the owner, Reed Peters, that I would be back this year. One of my big reasons for returning was to see a spectacularly beautiful bird, an Elegant Trogon, that makes an annual migration to the United States, but only to a very small area around Cave Creek. 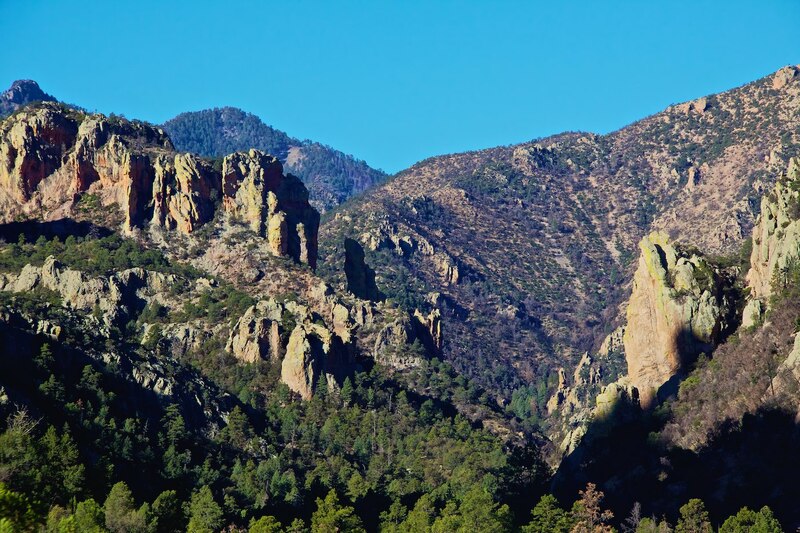 The Cave Creek that I love is in the Chiricahua Mountains of Southeastern Arizona. This means south and east of Tucson. Confusingly, Arizona has another Cave Creek that more Arizonans know. It flows through the town of Cave Creek and into Phoenix. I wanted to photograph an Elegant Trogon so much that I hired a guide to find me one. I had seen other attractive species of trogons in Panama, Belize, and Costa Rica, but none are as beautiful as the one that comes to this small area of Southeastern Arizona. The first morning that I went to Cave Creek this time I went with Peg Abbott who leads birding tours all around the world through her company, Naturalist Journeys. We found an Elegant Trogon right away and got really close to one — so close that a couple of times he flew within six feet toward me. I was happy with the photos I got with my external flash and Better Beamer that I had to use because the sky was overcast. When we drove out of Cave Creek into the desert, we didn’t expect much. 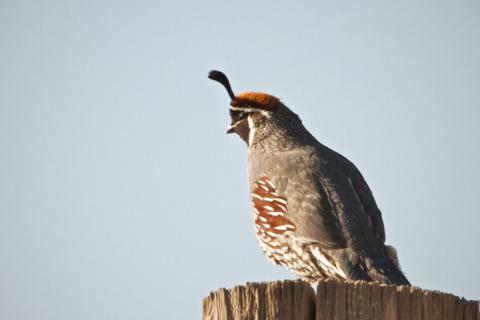 But a few years ago Dave Jasper set up bird feeders in his backyard known as the “Big Thicket.” They attract desert residents and migrants that don’t venture up into the canyon. The new owner, Bob Rodrigues, continues to make them available to all comers. I met Bob and asked if he was the owner of the property. He said he was and introduced himself. When he told me his name, inquisitive reporter that I am, I asked if he were of Spanish or Portuguese descent. I told him that half of mine did too. We bonded. “Countryman,” he called me. But even before we got to his wonderful backyard, Sharon and I saw one of the birds that we had most wanted to see in Southeast Arizona. After turning north off the main road from Cave Creek, we came to a rough dirt road. On a post next to the road was a Gambel’s Quail. This was the lookout bird. Several of them scampered across the road when we stopped. The South Fork of Cave Creek is the jewel of the Chiricahua Mountains, and birders from all the world over know that. Sharon and I spent a lot of time walking along the 1.3 mile South Fork Road into the canyon. At one time I counted 20 birders along this dirt road, including several who had come from overseas. But even better is the lower part of the South Creek Trail 1.5 miles up to a trail junction known as Maple Camp. The hike that Sharon and I took early in the morning of our second day at Cave Creek Ranch was the highlight of our exploration of Cave Creek Canyon. The morning was surprisingly cloudless and warmer after the storm that had blown through the day before. While we waited out the rain the previous day Reed Peters, the owner of Cave Creek Ranch, had briefed us the about the best places to go. “This is the most beautiful trail,” he told us. In fact, it is one of the most beautiful trails I have ever hiked. It’s right up there with the Fall Creek Trail near Santa Cruz and the Emerald Lake Trail in Rocky Mountain National Park. But with fewer people. I fell in love with Cave Creek Canyon and plan to return next spring. Sharon and I hiked alone on the South Fork Trail and rarely saw anyone in the several hours we explored it. We saw lots more birds than people. The trail follows the clear creek all the way, except when the creek runs underground. We didn’t follow it there.